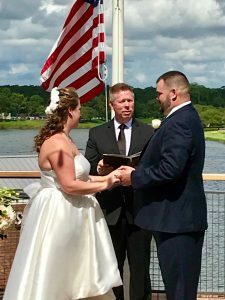 Nicholas and Malia wanted to get married at the happiest place on earth and so they decided to make their dreams come true with an intimate wedding at Paddlefish at Disney Springs. Located in the heart of Walt Disney World Resort in Orlando, Florida, Disney Springs is a mecca for great shopping at the Disney stores, high-end fashion boutiques, as well as home to a number of world class restaurants to fit every taste bud. May the road rise up to meet you. May the wind be always at your back. May the sun shine warm upon your face, the rains fall soft upon the fields. May the light of friendship guide your paths together. May the laughter of children grace the halls of your home. May the joy of living for one another trip a smile from your lips, A twinkle from your eye. And when eternity beckons, at the end of a life heaped high with love, May the good Lord embrace you with the arms that have nurtured you the whole length of your joy-filled days. May the gracious God hold you both in the palm of His hands. And, today, may the Spirit of Love find a dwelling place in your hearts. Amen. Lesley with Flowers by Lesley created the beautiful blush pink and white bouquets and boutonnieres for the wedding party, as well as the flower girl’s basket filled with pink and white petals. Christopher Smith with Snap Art worked with the couple to capture every moment of their wedding. From the entrance of the bride to “Tale as Old as Time” to the recessional of the couple to “Lava You,” and then family and group pictures. Chris captured it all. Once the pictures were over the couple and their guests dinned to the delicious cuisine of Paddlefish. A huge thank you to Victoria with Intimate Weddings of Orlando for organizing the vendors and working with Malia and Nicholas to make this a wedding of a lifetime. What a wonderful day for such a beautiful wedding!